Last month, I had an unpleasant experience with a fairly large brand. I contacted the brand on Twitter. While the brand responded to me in less than an hour, it wanted me to call into customer service. But wait a minute. Didn’t I just reach the brand? Didn’t I just contact them for help? Why would I have to take additional steps to resolve my issue? Shouldn’t the brand resolve my issue instead of passing me off to someone else? I reach out to a brand on social media when I have a customer issue for a couple of reasons. First, I get a more timely response. Second, I get a more timely resolution. Brands must have the capability to handle customer issues through their social channels. According to a survey J.D. Power conducted in 2013, 67% of consumers have used social media to resolve their customer service issues. Also, Nielson found that 33% of customers prefer to contact brands via social media than the telephone or email. And, according to Microsoft’s 2016 State of Global Customer Service Report, 64% percent of millennials believe social media is an effective customer service channel. Customer inquiries on social are increasing. In Twitter’s recent research, it found that customer service conversations had increased by 2.5x in the past two years. Since it is social media, customers expect timely resolution. Fast responses are an essential part of meeting customer expectations for social care. Twitter found that 60% of consumers expect brands to respond to their query within the hour. Brands are missing the boat and not taking advantage of a golden opportunity to enhance the customer experience. A recent study that Five9 conducted with the International Customer Research Institute (ICMI) revealed that while more than 68% of businesses recognize social media as a necessary service channel, 60% of companies are not formally supporting social customer care. Twitter said that companies were handling only 60% of customer inquiries. According to Conversocial, 88% of consumers are less likely to buy from companies who leave complaints unattended. Gartner found that failure to respond via social channels can lead to a 15% increase in churn rate for existing customers. Brands are missing the point – it’s about the customer, not the brand. Not taking care of customers is costing brands millions. A recent report by New Voice Media says companies are losing $62 billion per year through poor customer service. Yet, providing social customer service lowers costs and increases revenues. In Conversocial’s State of Social Customer Service Report, it stated that according to Gartner, it costs less than $1 per interaction on social, compared to $6 per phone call and $2.50-5 per email. And, according to research conducted by Eptica, Facebook and Twitter outperform email in both speed and accuracy of delivering responses. When customers receive favorable service, advocacy increases. According to Convince & Convert, resolving an issue can increase advocacy by as much as 25% (versus not responding to an issue can decrease advocacy by as much as 50%). According to Twitter, 76% of consumers are likely to recommend the brand following friendly service. Bain notes that when companies engage and respond to customers over social, those customers spend 20-40% more with them. McKinsey reports that companies that developed social care capabilities improved year-over-year revenue per contract by 6.7% through effective up-selling, cross-selling and customer churn reduction versus a 12.1% decline for those without that capability. And, according to Aberdeen, companies that have a well-crafted social customer service approach experience 92% customer retention. 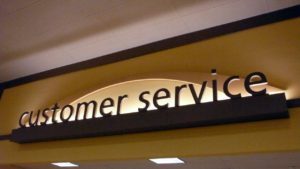 Social Customer Service is a big deal. In fact, social customer service serves as an inflection point – it can determine whether a customer continues to do business with you, or decides not to do business with you at all! Social Customer Service is that critical that Gartner believes that by 2020, 90% of customer service will occur through social media. So what can companies do to include social customer service in their processes? Show up and Be Active on Social Media. If a brand is going to be on social media, it needs to be visible on social media. The brand needs to be active, constantly and consistently. Consumers need to see you and see that you care. Social media is not just about promotion. Listening, engaging with customers and would-be-customers and helping to answer questions, solve issues, etc. are important and should be more important than simply broadcasting or promoting yourself on social media. According to Hosting Facts, as of March 2017, there were almost 4 billion Internet users. And, social media still ranks as the #1 online activity. Brands must be where people are at. And, they must offer some type of social customer service. The sustainability of the brand depends on it. Social Media is a quick reply platform. Consumers require quick responses. And social media enables brands to provide quick responses. In fact, consumers are more likely to connect with and recommend a brand which gives them a quick and effective response than a brand that gives them a slow and effective solution to their problem. Make Social Customer Service a Valuable Piece of the Omni-Channel Customer Experience. Customer-centric organizations find the best way to deliver a sound customer experience is through an omni-channel strategy. An omni-channel customer experience is defined as a consistent customer experience that occurs across all channels of an organization. It enables the customer to have the same experience at whichever channel they are in. It’s important because customers expect the same level of convenient, personalized, seamless experience wherever they are – be it online, mobile, online or in an actual store. Throughout each stage of the customer journey, brands must deliver on quality and consistency. And to support this, brands must implement an omnichannel customer strategy. If social customer service is unavailable, the brand’s growth could be in jeopardy. -Omni-channel contact centers achieve 55% greater annual improvement in the number of customer complaints. -The use of effective omni-channel activities helps best- in-class organizations retain twice more of their clientele. -Best-in-Class organizations are 30% more likely to align the entire business around the customer to ensure consistency and personalization. Therefore, to have an omni-channel customer service, it is vital that social customer service be a valuable component. Implement Best Practices To Make Social Customer Service Stick. Responsiveness is a big thing. Consumers want brands to respond immediately. In fact, Facebook Pages show a company’s response times to resolve issues. The reality is social media implies immediacy, and customers expect it. And that means customer service needs to be up to the task of responding within minutes. Social Customer Service isn’t only about solving problems, it’s also an opportunity to connect authentically, engage, and leave a lasting positive impression that will drive loyalty. Quick response and resolution will enhance the overall customer experience. Consistency is one of the most important things to providing a great experience. It builds trust. It illustrates what customers can come to expect from a brand. Consistency also drives retention, loyalty, and advocacy, and helps you acquire new customers in the process. Being authentic and showing empathy creates experiences that drive loyalty. You’ll be able to connect and engage on a deeper, more personal level and customers will leave feeling happy because you will have resolved issues timely and effectively. Social customer service isn’t only about resolving issues timely and effectively. It’s also about anticipating needs and acting accordingly. Social Customer Service provides opportunities to do that. It provides a great opportunity to obtain customer feedback or offer tools to help customers be more successful. Brands should always be on the lookout for opportunities to drive customer value. –Share insights with other teams of the organization. The information you obtain from engaging with customers is vital to be able to improve the customer experience. Thus, you should share insights with other groups of the organization so these insights can be acted on and improvements to existing organizational processes can be made to enhance customers’ experiences. Measure the social customer service you’re providing through such metrics as customer satisfaction, customer effort, net promoter score and others. It’s important to not only measure but also to monitor and analyze trends so you can make improvements to enhance a customer’s experience. Providing a good customer experience is a must. Having all tools at their disposal, including social customer service, will help brands create experiences customers want. Social Customer Service will help brands shape conversations by engaging customers before and after purchase, and drive customer value. Social customer experience is an effective way to promote brands because people often use social media to resolve their customer service issues. Social media is a more engaging platform and people often respond immediately, for e.g. business pages on Facebook. Nice article @Sue. It is true that Social Customer Service is Vital to a Better Customer Experience. Hence social customer service lowers costs and increases revenues.